Cutting Overhead, Committed to Travel — My initial trips last Autumn and early this year convinced me that it does not make sense for me to keep my apartment during the active travel and photography phase of the project. Not only are rent and utilities a serious financial drain, but the logistics of working from a “home base” simply don’t make sense given the great distances of the remaining monasteries spread across the continent. There will likely be some discomfort and surprises along the way associated with this decision, but as on a true holy pilgrimage the challenges simply must be “suffered through”, and I trust the total commitment this approach requires will serve the project far better than a more leisurely pace punctuated by home comforts every so often. On schedule to deliver fine art prints to supporters this Summer — Although the finished book is not scheduled for publication until mid-2018 with distribution beginning that Autumn, the Thebaid Project promised to supporters contributing at the $100 dollar level and up, in addition to copies of the book, signed & matted fine-art prints. These archival prints set in acid-free and lignin-free museum mats were scheduled to be delivered to supporters beginning in “mid-2017.” I’m pleased to report that I have all the materials assembled, and will begin matting, signing and wrapping the fine art prints later this week or early next, with delivery to supporters beginning immediately thereafter. I’m very energized to reach this important juncture, providing the “first fruits” of the Thebaid Pilgrimage to our supporters. This will be the first physical reward to our Thebaid Association members, advisors, contributors, and of course, the monastics themselves. The majority of the first round of fine-art prints will be hand-delivered to supporters at the various parishes which have hosted me for presentations and fundraisers, beginning of course with my home parish of Christ the Savior-Holy Spirit in Cincinnati. In addition to parish deliveries, shipments of the signed/matted prints to supporters will begin in early July, so watch your mailboxes! Additional parish visits coming up — Parish presentations continue to be the most effective way to generate interest in the Thebaid Pilgrimage, plus it’s a joy to visit Orthodox churches along my route. Pre-sales of both the Hardbound Standard Edition and the Leather-Bound Deluxe Limited Edition help fund the travel and photography, while providing us with accurate numbers for the initial print run. And as from the start, all members of host parishes receive the Digital Rewards Package of two ebooks and high-res images of Mount Athos. 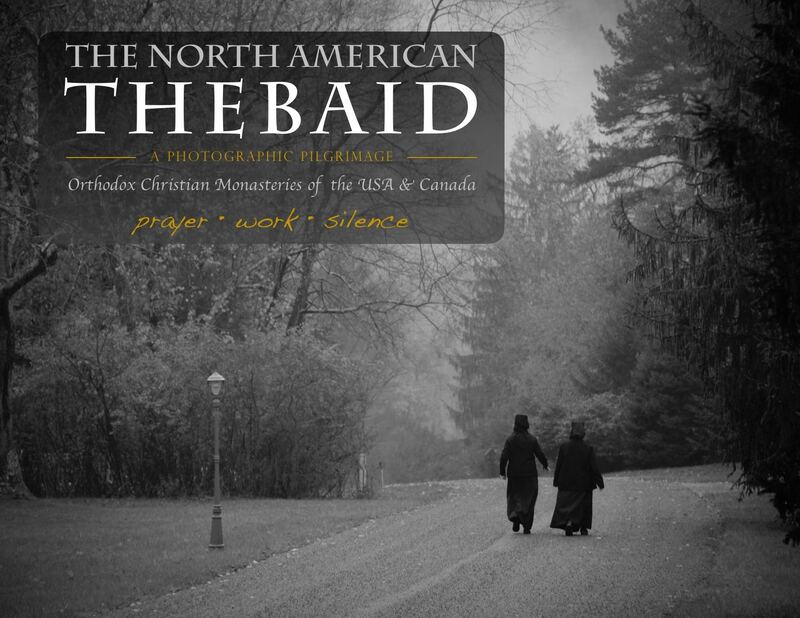 I look forward to scheduling parish visits along every leg of the journey throughout the USA and Canada, and will be posting the itinerary on the Thebaid website and social media. Please contact me to schedule a presentation. No parish is too far away when you’re traveling literally to the four corners of the continent! So, there’s the update. My heartfelt thanks to all of you who have waited patiently for my return, with special appreciation to those who reached out with messages and emails of encouragement during this recent quiet time. Special thanks and “Welcome aboard!” to our new supporters and Fellow Pilgrims who joined us during this period. May it be blessed! Through your prayers & support!